Motto: "Why hide who I am?" Passionate, independent, and unafraid to blaze their own trail no matter what others think, Scorpios make a statement wherever they go. They love debates, aren't afraid of controversy, and won't back down from a debate. They also hate people who aren't genuine, and are all about being authentic-even if authentic isn't pretty. But once people get beyond the shell, they find a loyal, loving person whose passion knows no bounds. Scorpio dives into all life has to offer with 110% enthusiasm. A Scorpio will be your most loyal friend, most dedicated employee-and your worst enemy, if they want to be. 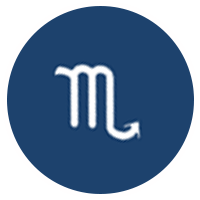 In love, Scorpio can seem cautious at first, and may set up a series of "tests" for their potential partner, deciding to cross them off their list if they don't meet their demands. The trouble is, they tend to keep their partner out of the loop on what, exactly, they want, making their partner feel like they have to play mind reader. If a Scorpio and their partner can get past this initial hurdle, the connection will be intense, in both highs and lows. A Scorpio will love harder and fight harder than any other sign, and wants their partner to be absolutely honest. They will be-even if it's not what the partner wants to hear. In the bedroom, Scorpio is generous, imaginative, and always up for anything-all night long. You know what you want and go after it-no questions asked. You're passionate. When you decide to put your heart on full display, there's no stopping you-which is why you should do it more often!